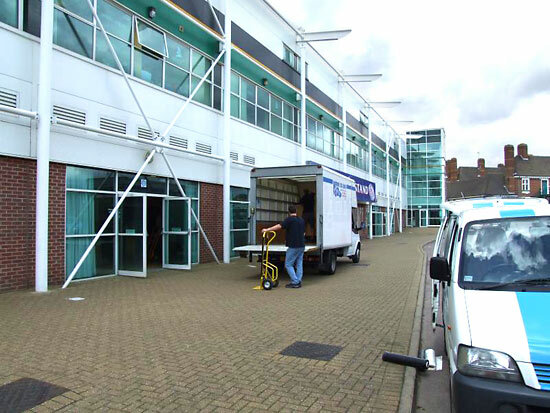 Location: Tetleys Stand, Franklin's Gardens, Northampton Saints Rugby Ground, Weedon Road, Northampton, NN5 5BG, UK. Pictures by: Pinball News, D. Raison & Darren Ball. 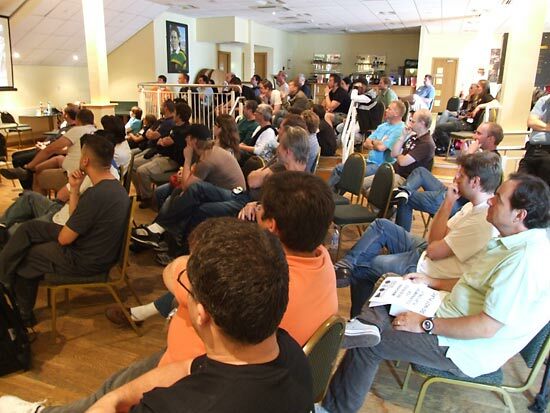 This was the fifth UK Pinball Show organised by Pinballers Anonymous and it was a special event for two different reasons. 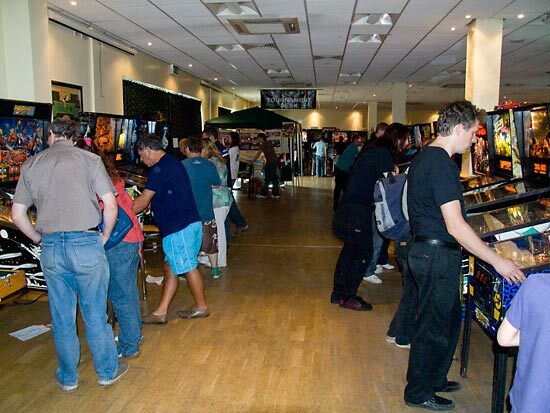 First of all, this was the inaugural UK Pinball Show to be held at Northampton Saints rugby ground. The first and second shows took place at Aston Villa football club while for years three and four the show moved to Wicksteed Park amusement park. This year, it remained in the same general area but moved 16 miles south-west to the centre of Northampton. 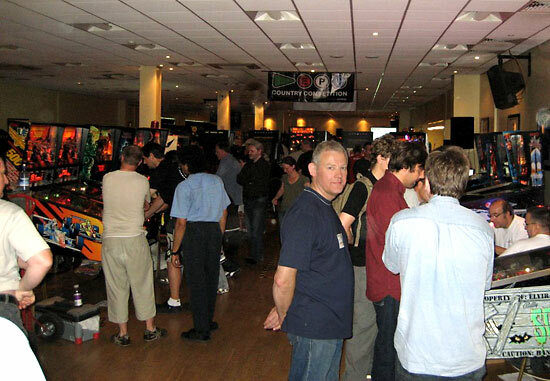 The second reason this was a special year was that the UK Pinball Show was host to the 2009 European Pinball Championship. The new venue was much more modern than previous locations and despite many people having fond memories of Wicksteed Park, those soon disappeared once they experienced the show's new home. Inside, the building was one long room punctuated by a row of pillars down the centre. 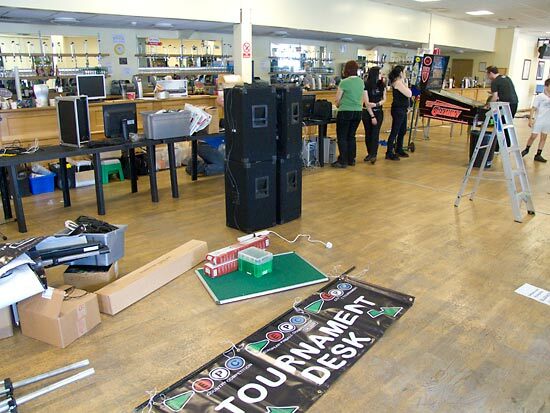 This created a fairly blank canvas on which the machines, vendors, tournaments and information desks could be painted. The only real negatives were the large number of fire exits which had to be kept clear of obstructions and the lack of catering facilities. There was a bar which was open during show hours and had typical pub prices, but show visitors could walk outside and across the road to a number of food outlets or head left or right for a quarter of a mile to find a whole bunch more. Not serving food inside the show hall helped ensure machines remained free of greasy fingerprints throughout. The show opened officially at 5pm on Friday 24th July but all the set-up work had to be done in the morning and afternoon of the same day. The electrical power work began around 9am to ensure there was enough power and sufficient outlets where they were needed. Andrew Harris had visited the building several weeks before the show to see what electrical equipment would be needed and he, Chris Williams and Keith Donaldson were responsible for the installation and layout of the cables, breakout boxes and sockets. Once the power distribution was nearing completion, machines could be brought in and set up. 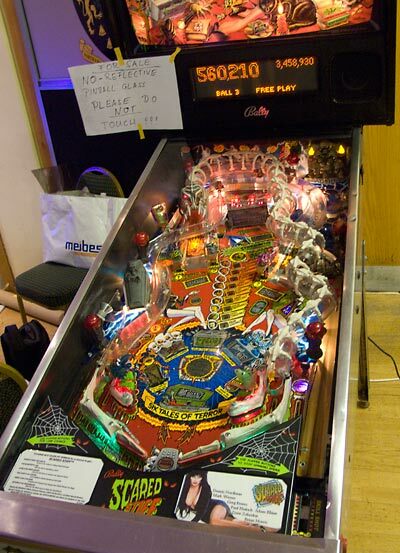 An editable list of machines being brought to the show had been set up on the UK Pinball wiki web site and the total on there had nudged up to almost 100 by the time of the show, but people's plans change and not everyone knew about the page, so the exact number of machines arriving was still unknown. To accommodate the European Pinball Championship and the other competitive events, the area behind the pillars in the picture above was allocated to the tournaments team to hold the EPC, the Country Competition, the Classic Tournament and the Kids Tournament. The diagram below is rough plan of the show's layout with R representing recreational play machines and V is for vendor stands. Machines continued to arrive throughout the morning and afternoon. Several visitors called in during the set-up time to either help get the games on their legs or just to find out which machines would be used in the EPC which began later that day. The hours raced past and suddenly it was 5pm. Machines were set up, vendors were ready to start selling and visitors were arriving. The show had begun. Entrance to the show cost £10 per day or £17 for the three days. Each ticket admitted one adult and also included free entrance for one child. Additional child tickets were £2.50 per day or £5 for the weekend. Those bringing machines for recreational play or for the tournaments got free entry for the whole show weekend. Some machines arrived and were quickly sold, or were pre-sold and brought to the show to be played and then taken away by the new owner. 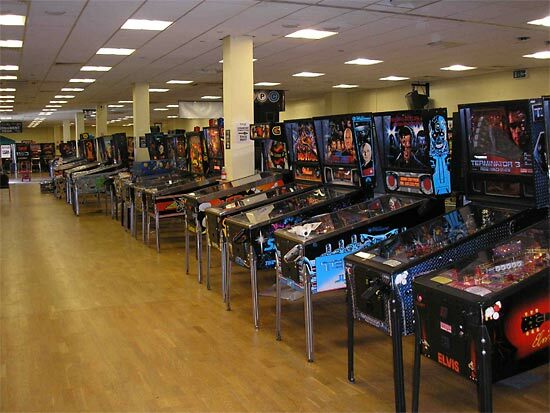 However, at the busiest time on Saturday afternoon there were 136 machines set up at the UK Pinball Show. The mix of games this year was much improved on previous years. 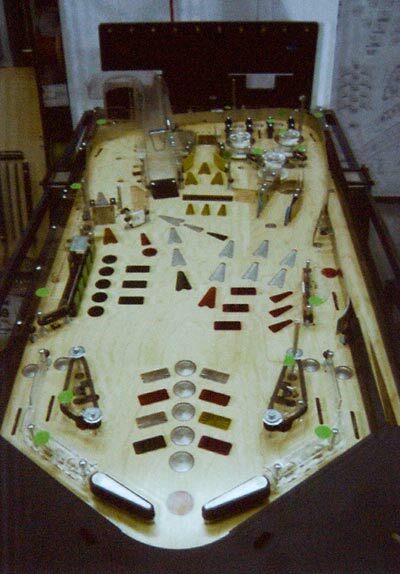 There were many more solid state machines and some unusual games such as the two Gottlieb "street level" models - Title Fight and Vegas - brought from Holland by Ad Jonker, Eddie Mole's Stern Star Gazer and Lightning, and Mark Squires's Operation Thunder. 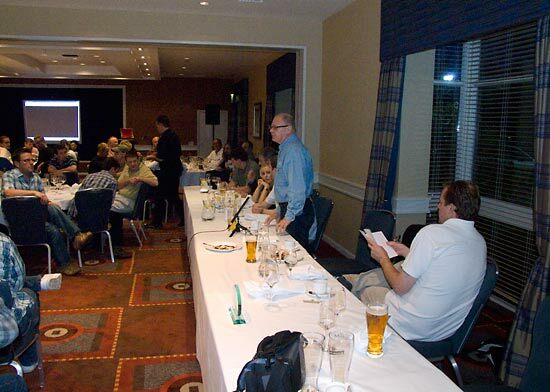 The special guest at the UK Pinball Show and at the awards dinner on Saturday night was designer Steve Ritchie, so naturally there were plenty of his games in attendance. In fact the most common machine at the show was his Star Trek - The Next Generation. 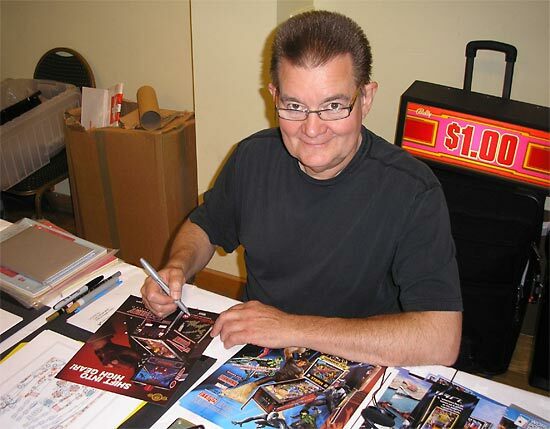 Steve also attended the show all three days, signing autographs, talking about his games and playing various machines around the hall. He was stationed next to Gary Flower's stand who, like other vendors at the show, saw plenty of interested buyers over the course of the weekend. 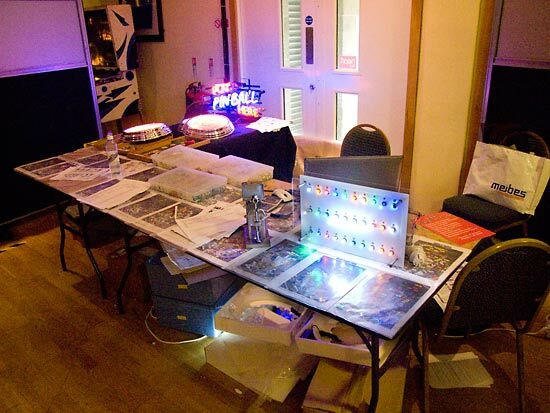 Next to Albert's stand selling his LEDs was a Scared Stiff fitted with Roman Kunovic's non-reflective glass which impressed everyone who examined it. Created using a chemical process, the glass looks invisible when viewed from overhead and greatly reduces glare from the DMD and overhead lighting as well as internal light reflections. 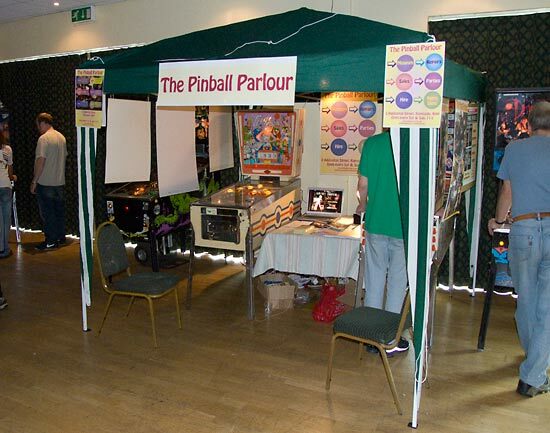 At the end of the hall, near the entrance, was a stand run by Andy and Lisa Netherwood of Pinball Mania and Dave Emery where numerous spares and components could be purchased. In addition, they also had a repair station set up to fix board faults on games at the show or boards brought in by visitors. On the entrance desk where visitors paid for the entrance, they could also purchase show t-shirts, mugs and various other goodies from Pinballers Anonymous. Peter Heath from The Pinball Parlour was also at the show to promote his pinball museum which opened recently in Ramsgate, Kent. 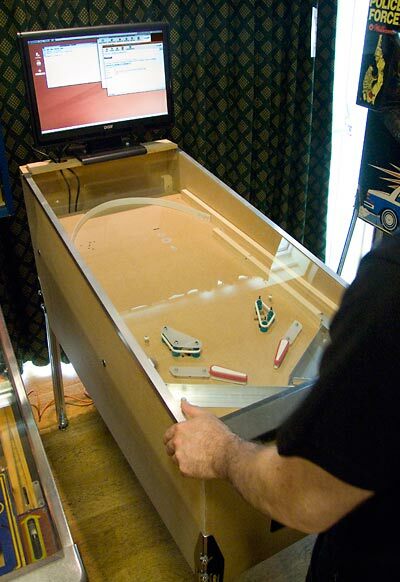 Paul Bustin brought his home-built pinball along to show the progress he's made in creating a flippable, working system. 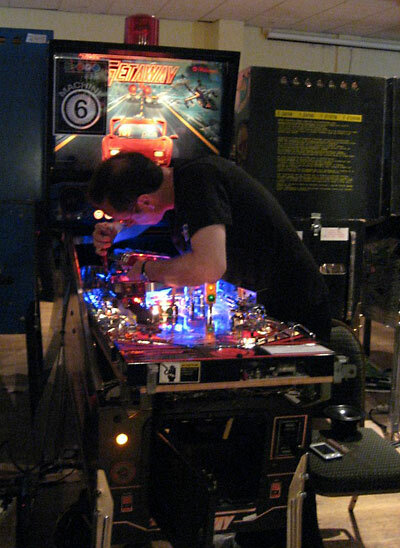 After building a MAME cabinet and seeing on the internet how other people were making their own pinballs, he built his own router and started building his own machine. Although he wasn't able to demonstrate too much of it at the show, his machine includes a bus-based control system with input/output boards under the playfield for simplified wiring, LEDs using pulse width modulation to vary the brightness and achieve lamp-like fades, radio control-type servos to drive the various assemblies and pulse width control of solenoids to vary the power and eliminate hold windings. The show continued until 11:30pm on Friday night and began again at 10am on Saturday morning. At 6pm the show close to allow people time to get to the nearby Marriott hotel for the awards dinner which started with drinks in the bar at 7pm and a sit down three-course dinner from 7:30pm. After the dinner, Gary Flower introduced the evening's guest speaker Steve Ritchie who got up to make a slideshow presentation from the front of the room. 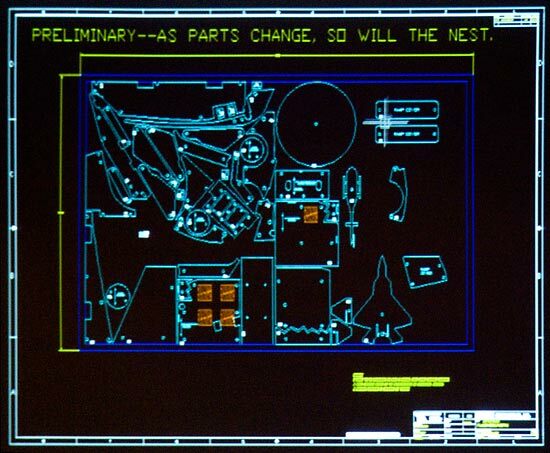 Steve's talk included a look around the Stern factory, an examination of the CAD drawings for a few of his more recent games including Spider-Man and 24, plus an explanation of how the nest of plastic parts is created to fit them all on a single sheet. The 24 CAD drawing revealed some mode name which never made it into production such as Save A Loved One, High Speed and Rescue. This picture of an early Spider-Man whitewood shows a very different arrangement of inserts above the flippers. Most of the rest remained unchanged when the game went into production, though. 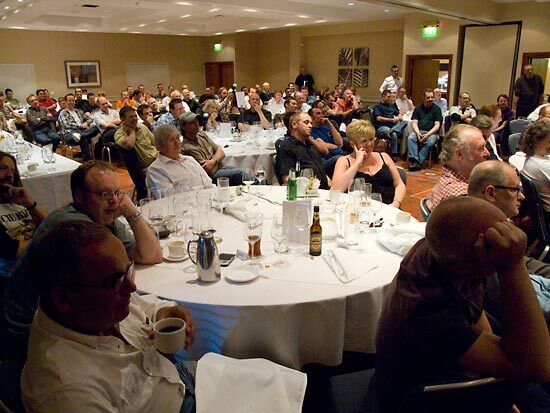 You can listen to Steve's talk at the UK Pinball Show dinner below. 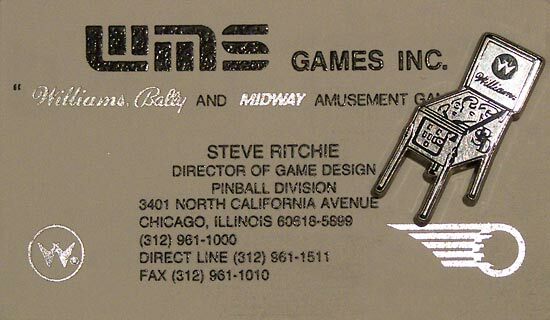 After his talk, Steve presented the PinGame Journal award for the best pre-1990s game at the show to Richard Harvey for his Firepower machine - which Steve designed, naturally. 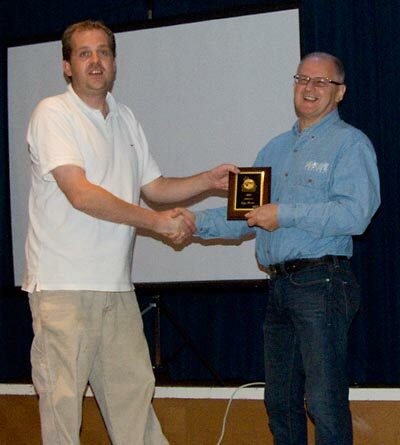 The next award was from Clints Amusements for the best modern pinball machine at the show and it went to Nick Marshall for his Terminator 2. 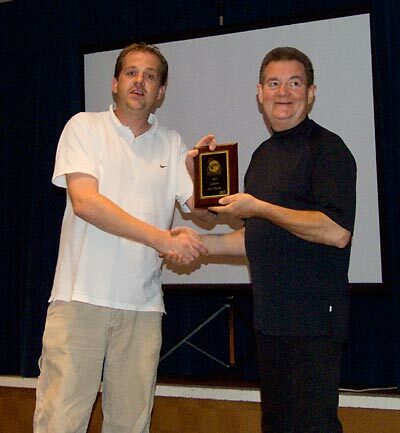 After that it was time for the second year of inductees into the UK Pinball Show Hall Of Fame. 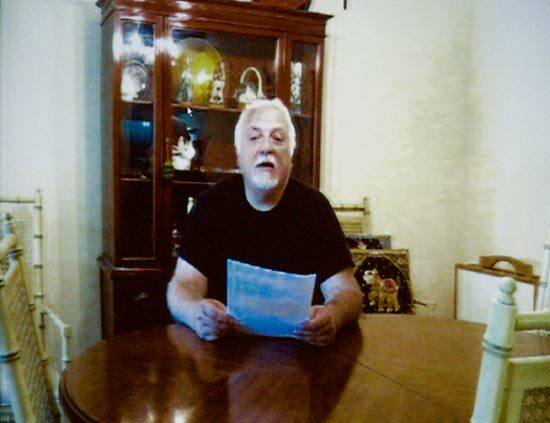 Show and dinner organiser Nick Bennett asked one of last year's inductees - John Trudeau - to write a few words about this year's entrants. Instead, he sent a video recording which was played on the screen. The first inductee was John's colleague at Williams and the show's special guest, Steve Ritchie. 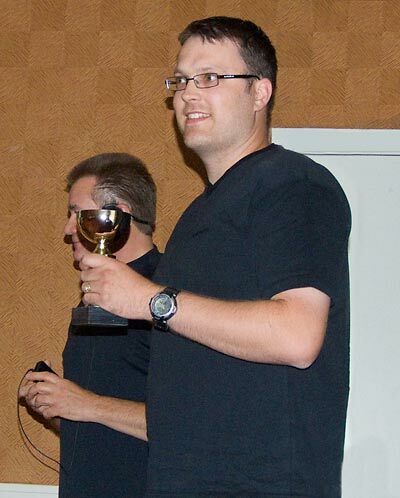 The second entrant for this year was pinball historian and author, Gary Flower. The final - somewhat reluctant - entrant of the evening was coerced into his acceptance by popular demand; show organiser Nick Bennett. 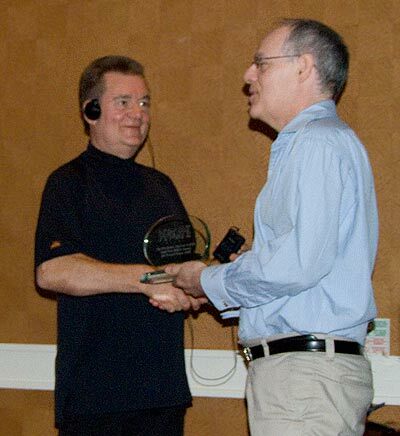 Nick was given his award by Mark Squires. Nick was also presented with a gift from Steve Ritchie, who gave him a special pin badge given to Steve during his time at Williams. With that, the dinner drew to a close and diners retired to the adjacent bar to relax over more drinks into the early hours of the morning. 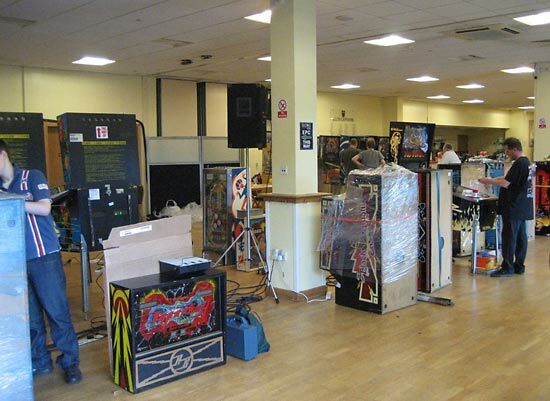 Along with a hangover, Sunday morning also brought a new feature for the UK Pinball Show - a series of free seminars on machine set-up, repair and restoration. 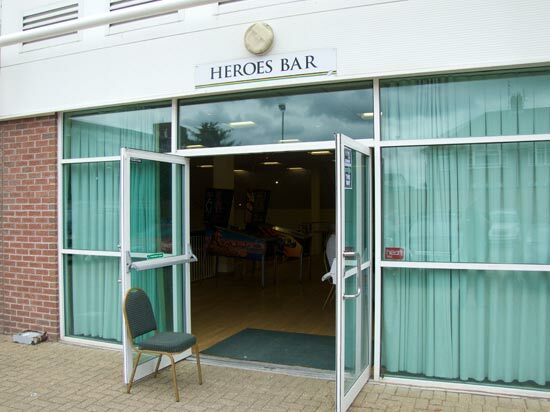 The EPC tournament team had hired an additional room (the Heroes Bar) to hold the EPC semi-finals, the EPC final and the final of the Classic Tournament. 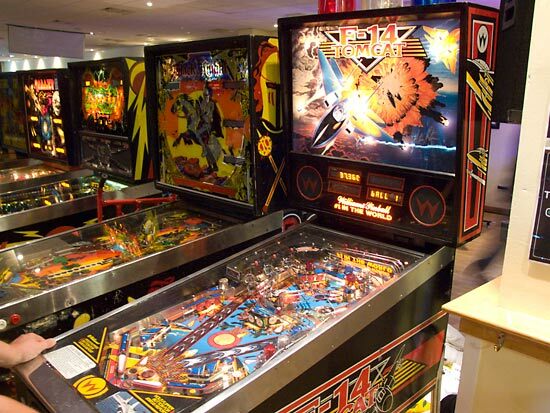 Those events wouldn't take place until later in the day so they asked the UK Pinball Group to come up with ideas for the room in the morning. The overwhelming favourite was repair seminars, so ace repairers and restorers David Blake and Dave Emery kindly offered to host a total of three talks. David Blake would take the first two on setting up a machine and Williams WPC repairs. Dave Emery then took over to talk about electromechanical repairs and restoration techniques. They were assisted in their presentations by David Rolfe. When starting something new like this, you never know if anyone who indicated they would be interested would actually turn up. 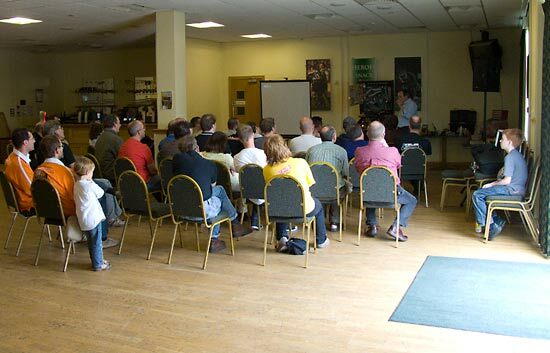 Fortunately, the seminars were all well attended and equally well received. 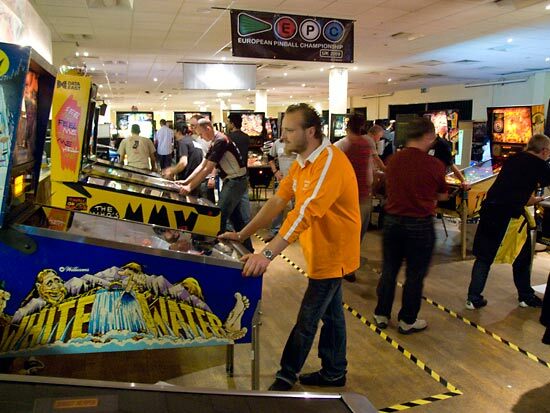 For many visitors, one of the main attractions of the show was the European Pinball Championship 2009 (EPC) which was one of the four tournaments held at the UK Pinball Show. 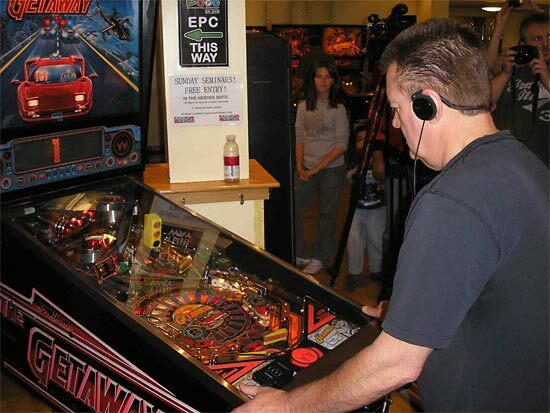 Planning for the EPC began 18 months earlier when a format was devised and tested at the 2008 UK Pinball Show. 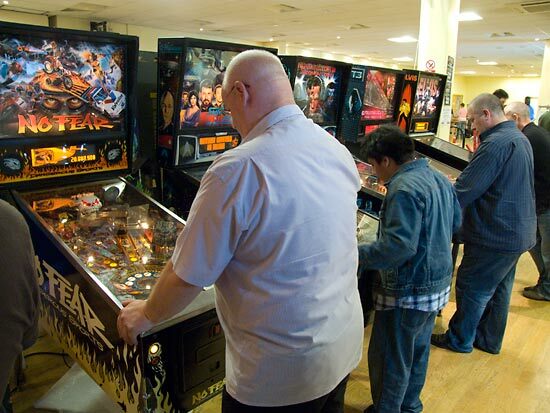 The UK Pinball Open - as it then was - proved highly popular and clearly demonstrated the positive aspects of the format as well as the potential difficulties. By tripling the number of machines and introducing a joker game, the format for the EPC was set at the start of 2009. Registration for the 150 places began on 1st March with the expectation it would remain open for 3 months. As it turned out, all 150 places were snapped up in just over 3 days, and registrations were still coming in as the 150 mark was passed, resulting in 161 players signing up and paying before the plug could be pulled. The EPC began at 6pm on Friday evening but queues built up at the registration desk from the moment the show's doors opened while machines were still being leveled, cleaned and the correct settings installed. All EPC players were pre-registered so they only had to identify themselves and collect their player name badge, their score card and a special joker card from the desk team of Adeline Prevost, Anne Raison, Emily Raison and Jayne Raison. 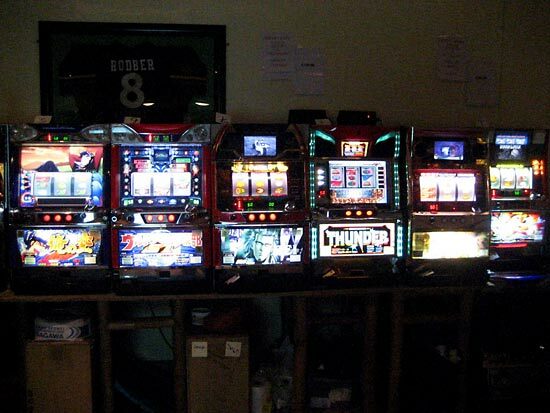 Every player could choose six of the 18 available machines and play a single game on each. Their scores would be ranked against all other players on those machines and ranking points awarded - 100 for the top score, 1 for the bottom. Bearing in mind the quality of the competitors and with a view to rewarding great ball control, the machines were set on hard or extra-hard settings and the outlane posts either adjusted to their maximum width or removed, where appropriate. If a player had an especially bad game, they could play their joker card and replay a game on that machine. If they got a higher score, it replaced their previous score. If their joker score was lower, it would be discarded. That ensured one poor game didn't derail a good player's progress into the next round. 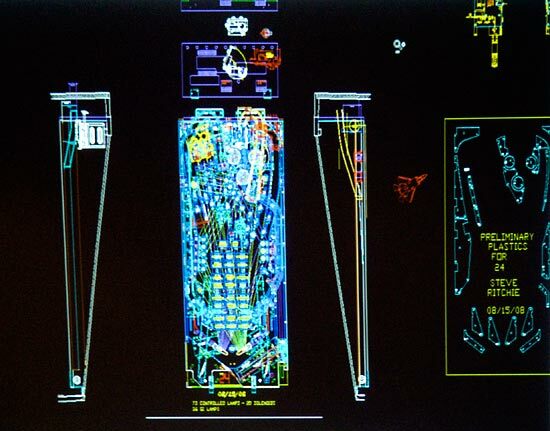 Overall rankings were shown on two projector screens - one next to the tournament desk and one on the main corridor - while individual machine scores were shown on a monitor at the desk. The ranking display showed the points earned by each player on their chosen machines, the total number of points and who was currently qualifying for the next round. As last year, the scores were collected by the team of marshals led by Richard Wade with Anne Raison and Martin Ayub. They were assisted by Ad Jonker, Nick Marshall, Emily, Jayne and Adeline from the desk team and the computer systems team of David Raison and Phillip Eaton. Richard also fixed machine problems as they arose or, if they would take some time to fix, called on the services of Andy Netherwood or Mark Squires. 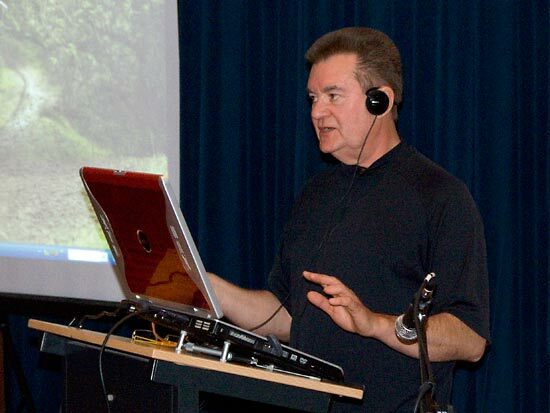 Scores were recorded using handheld computers running simple web browsers. The Dell X3i devices used a WiFi link back to the main servers to allow players' details to be called up and all their scores so far to be displayed. New scores could then be added and sent back to the main database. The recorded score was then automatically looked up and send back to the handheld computer to be shown to the player as confirmation of the score recorded against their name. 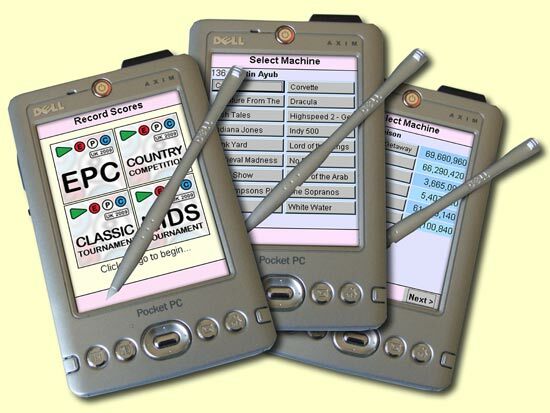 The handheld computers were used for the all the various tournaments' scoring over the three days of the show. When the EPC started at 6pm on Friday, in the adjacent area the EPC Country Competition was also getting under way. Organised by Nick Marshall and run by Ivan Durneen, Aid Cooper and Stan Simpson, the Country Competition was another very popular contest which ended up being over-subscribed. The format allowed for up to 20 national teams of 4 players - quite a few more than previously - with a maximum of three from any one country. 22 teams registered so because of the popularity, the number of teams per country who would be guaranteed entry was cut back to two. The 20 registered teams who paid their £10 entry fee represented France, Spain, UK, Belgium, The Netherlands, Switzerland, USA, Austria, Germany, Sweden and Finland. Not all countries entered two or more teams, so all the third teams from each country were ranked in the same way and the highest ranked (Sweden 3) joined the tournament. Those who missed out were placed on a waiting list in case of cancellations. In fact, last minute flight schedule changes meant Team Finland would not be able to arrive in time for the tournament, so they were replaced on the day by the UK's third team. The Country Competition was split into two rounds - a qualifying round and a final round. In the qualifying round, each team played three matches against other teams in a mixture of head-to-head games - where two players from each team played two from the opposing team on a pair of machines - and a 4-ball (1 ball per player) game on one of a pair of identical Indianapolis 500 machines. Points were awarded for the finishing positions in the head-to-head games, with 9 points for the winning player, 5 for second place, 2 for third and no points for last place. All teams were also ranked on the Indianapolis 500 machines where 17 points went to the top team. 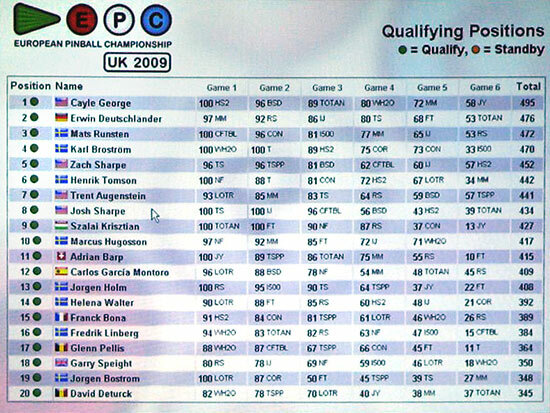 As with the EPC, hand held computers were used to record the points awarded and the 4-ball machine scores with the results and current standings displayed on a pair of monitors in the Country Competition area. With so many of the world's top players taking part, the final round stretched into the night. Because the show had to close by midnight, it was decided by the teams to continue the final the next morning. So the last two sets of matches were played on Saturday when the show re-opened at 10am and they revealed quite a reversal of fortunes as The Jochniyle Trans-Atlantic Express moved from the last qualifying place up to first place to take the win. Sweden 3 also moved right up to take second place while top qualifiers Swedish Erotica #1 dropped two places to third position. The top teams were awarded with their trophies and medals by Tournament Director Martin Ayub and Anne Raison. The winners received laser-etched crystal trophies and gold medals. At the same time as the EPC and the Country Competition, the Kids Tournament was taking place in the main EPC area. 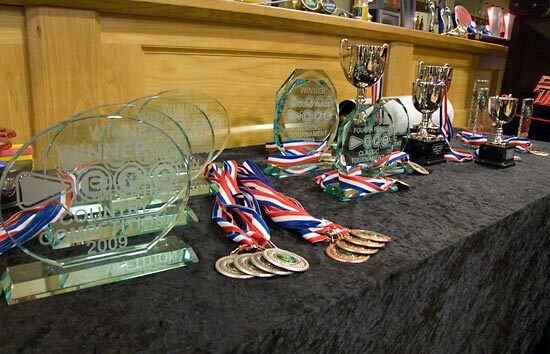 The Kids Tournament would run on Saturday and Sunday, with separate trophies and medals awarded each day. On Saturday the tournament game was High Speed 2 - The Getaway and the format was a straight battle to get the highest score of the day in order to win. Entry cost £1 per attempt and players could play as often as they wished which brought some fierce competition as top score after top score was beaten and the leading positions reshuffled. The tournament came to a close at 5pm on Saturday at which time it was 11-year-old William Moore from the Isle Of Wight in the UK who was leading the pack and took first place. 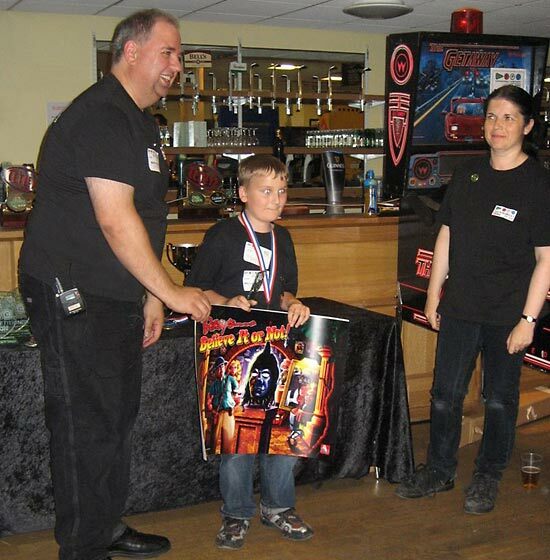 William received a glass trophy, a gold medal and a Ripley's Believe It Or Not translite donated by Parts4Pinballs in Norway. 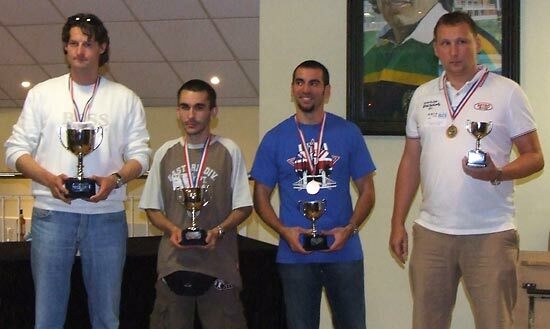 In second place was Victor Cerdana from Spain who took away a glass trophy and a silver medal. 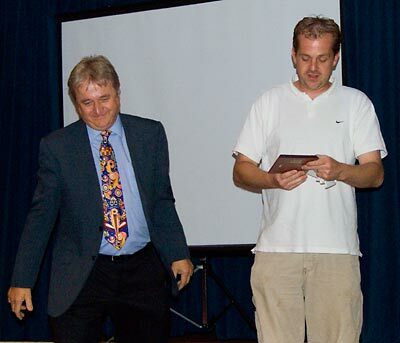 Third place went to Martyn Raison from the UK who was not present for the awards ceremony. As the Kids Tournament ended at 5pm on Saturday, the qualifying round for the main EPC 2009 tournament also drew to a close. 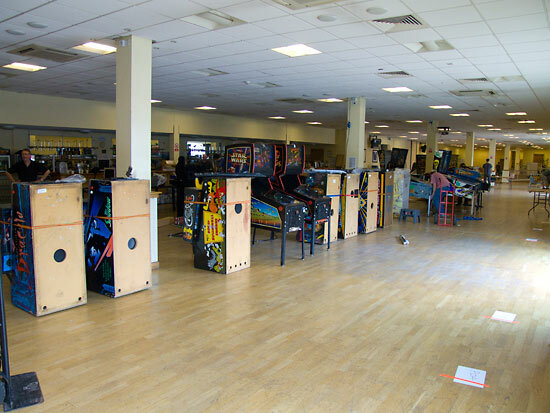 Last year, there was a big rush towards the end of the UK Pinball Open which resulted in some players not being able to play all their games in time. 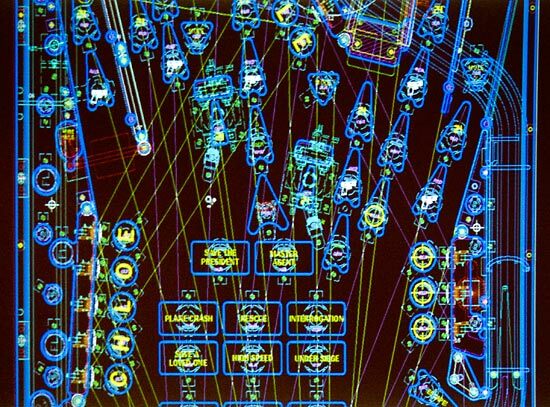 This year, in anticipation of a similar problem - and with 150 of the world's best players playing over a thousand qualifying games - the machines were on tough settings which helped keep the average game time down. In addition all competitors were warned several times by e-mail, on printed material and over the public address system not to leave their games until the end and to play them as early as possible. To the credit of all participants they heeded the advice, which meant when the qualifying closed at 5pm, all games (including joker games) had been played and nobody was still playing. There was a small number of stand-by players in case any of the qualifiers couldn't make it to the show on Sunday, but all 32 checked in and collected their new player badges. The 32 were split into two groups of 16 for the quarter-final rounds. Those who qualified in positions 17-32 played first at 11am. The top 16 qualifiers played later at 1pm but the format and machines used for both groups were the same. The unused machines were removed from the area and set up as practice machines. Every qualifier played three matches. Each match consisted of two games on a single machine with a partner. The partner and the machine changed with each new match and the aim was to get the best score possible, since all scores on each machine would be ranked. Only the highest score of the two games on each machine counted and all players were given 30 seconds of warm-up time before each new match to get a feel for the new machine. When both groups had played all their quarter-final matches, the scores on each machine from both groups were combined and ranked with ranking points awarded. The 8 players with the highest ranking points on their three machines went into the semi-finals. As there had been the previous day, there was a Kids Tournament on Sunday. This time the machine used was a Data East Star Trek but the change of machine didn't lead to any change in the fiercely competitive battle for the top place. Yesterday's top players were back and once again it was William Moore and Victor Cedana slugging it out for the highest score. When the tournament ended at 4pm, once again it was William who took the honours with Victor in second and Roni Valkonen in third. 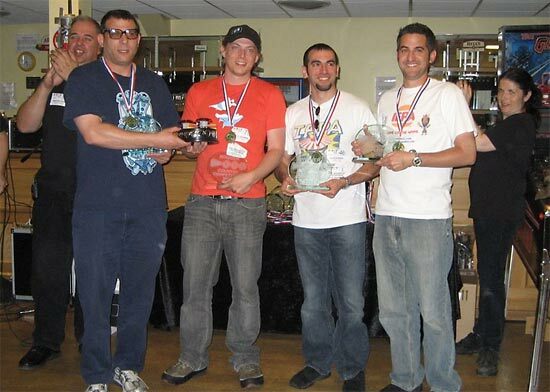 All three won glass trophies and medals while William also won an Indiana Jones translite donated by Ole at Parts4Pinballs. Here are the full results for Sunday's Kids Tournament. Only the top score for each player is shown. In the area behind the EPC quarter-finals, the fourth tournament of the weekend was taking place. The EPC Classic Tournament which was headed by Mike Parkins was open to everyone and gave players the chance to compete on a selection of older games. He and Paul Cowan had moved the Classic Tournament machines into position on Saturday afternoon in preparation for the start at 10am on Sunday. A Black Knight was originally in the line up but it suffered a fatal problem after a few games had been played, so it was removed and those players affected offered alternative games on its replacement or another machine. Scores were once again recorded using the hand held computers, wielded by Mike, Adrian Donati, Mike Kindler, Ad Jonker, Emily Raison and Jayne Raison. Individual machine scores and the current leaderboard were shown on two monitors in the Classic Tournament area. The tournament proved to be extremely popular and the area became somewhat crowded at times with players, those waiting to play and onlookers all keen to see how the machines played and learn the rules. On average there were 100 games played every hour in the Classic Tournament - about the same as during the main EPC qualifying period. In the semi-finals, the 8 qualifiers were split into two groups. Those who won on machines 1-4 were in the first group and they played their semi-final on a machine none of them had won on. 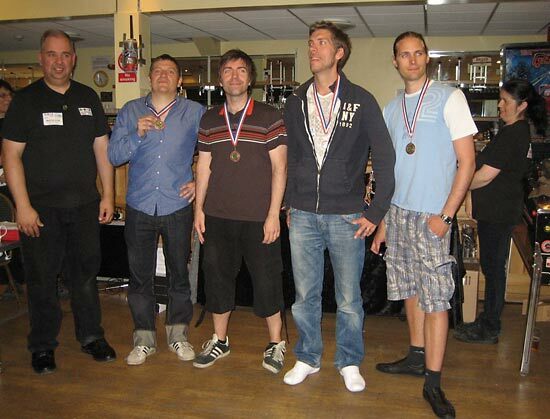 Similarly, the winners of machines 5-8 played one of the machines 1-4 for their semi-final. The selected machines for the semi-finals were Time Fantasy and Medusa and the top 2 on each would go through to the final. From those two semi-finals, it was Jim Belsito, Patrik Bodin, Neil Shatz and Jorgen Holm who made it into the final, beating Robert Sutter, Reidar Spets, Anders Birgersson and Per Holknekt. With the final of the Classic Tournament and the two semi-finals of the EPC remaining, the action moved into the Heroes Bar - the room next door to the main show hall which provided more space and a better setting for the conclusion of the two tournaments. A sizeable audience congregated to witness the best players compete for the top spots in the EPC and the Classic Tournament. The two semi-finals in the EPC were the first to be decided. Two machines were set up for the semi-finals - a Williams Dirty Harry from Ivan Durneen and a Stern Simpsons Pinball Party from Martin Ayub. The players who came 1st, 3rd, 5th and 7th in the quarter-finals played the Dirty Harry while those who finished 2nd, 4th, 6th and 8th played the Simpsons Pinball Party. There was no more ranking taking place. It was now a straight fight for position with the top two from each semi-final going into the final. Those who ended 3rd or 4th in each semi-final would go into a play-off for ultimate 5th-8th places. So Andrei Massenkoff, Krisztian Szalai, Adrian Barp and Paul Jongma played Dirty Harry and it was Paul and Krisztian who were the best two from the first semi-final and went into the final. 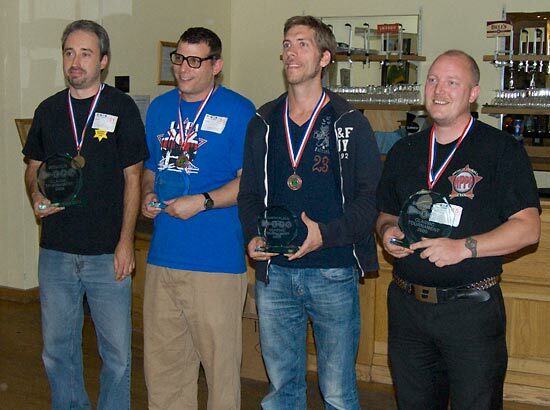 Laszlo Horn, Zach Sharpe, Karl Broström and Markus Stix contested the other two places on The Simpsons Pinball Party where Laszlo and Zach came out on top and made it through to the final. The EPC Classic Tournament final took place next at the same time as the EPC 5th-8th place play-off. The Classic Tournament final was held on a Williams Firepower. 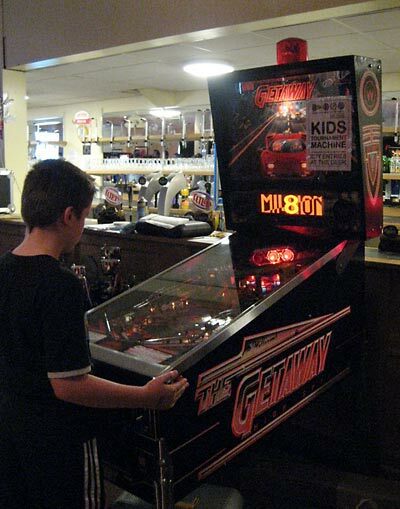 This was the machine which had won the best pre-1990s award at the dinner the previous evening and was owned by Richard Harvey of firepowerpinball.com so was an excellent example of the era. It was also a Steve Ritchie game as well, of course. The EPC 5th-8th place play-off took place on the same machine to be used for the EPC final - The Shadow by Bally. This was the machine owned by David Blake and used for his seminar on WPC fault finding and repairs earlier in the day, so it too had a good pedigree and provided an opportunity to demonstrate David's repair and restoration facilities. Needless to say, both machines performed flawlessly. Adrian Barp had to leave to catch his flight home before the 5th-8th place play-off, so it was down to Andrei Massenkoff, Markus Stix and Karl Broström to play for the 5th, 6th and 7th positions. 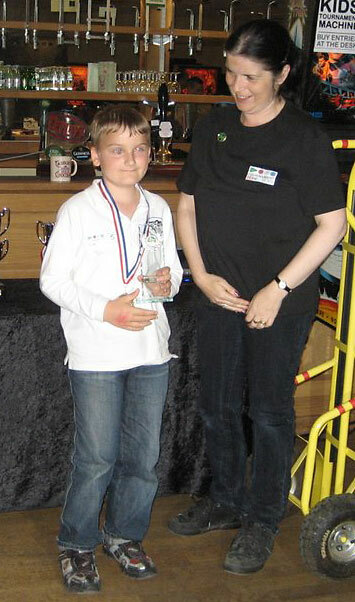 In the play-off, Karl had a great game, making it to Final Battle and ending his 5 ball match on 1,750,536,550. Neither Andrei nor Markus could break the 1 billion barrier but Andrei got closest to Karl's score with Markus in third. In the Classic Tournament final it was Jim Belsito who knew his shots and made them, to race ahead on the Firepower with some excellent bonus scores, ending his game on 1,313,400. Patrik Bodin was the closest of the trailing group with his final score of 512,390. Neil Shatz was in third place on 370,140 and Jorgen Holm never really got a good ball and wound up his game with a total of 72,860. 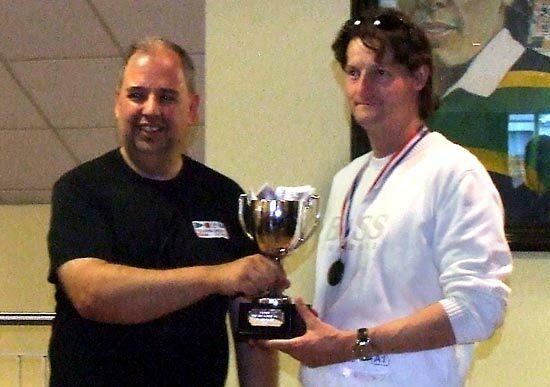 So Jim Belsito won the 2009 EPC Classic Tournament and collected his prize trophy along with his gold medal from tournament head Mike Parkins. Which left just the 4-player EPC final to contest. The two winners of the semi-finals had first choice of position to play. The selection choice order was determined by the players' quarter-final rankings and as expected Laszlo chose player 4 and Krisztian player 3. The two second place players in the semi-finals then had their choice with Zach choosing player 2 and Paul taking the remaining player 1 position. 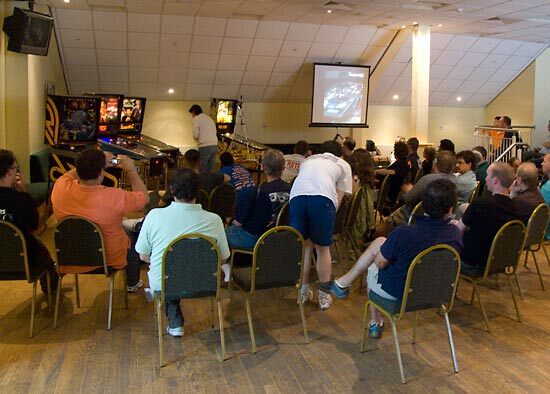 A video camera's feed was projected onto a screen so the audience could follow the action on the playfield and see the scores on the display. Paul began his game well, ending his first ball on 164M. Zach didn't get much of a ball and ended on 7M. Krisztian did better to score 103M on his first ball while Laszlo's ball was a quick as Zach's and he scored just 5M. Ball 2 brought the scores much closer together. Paul added 42M more to move his score up to 206.661M. Zach had a great ball to nudge into the lead by the smallest margin with his 206.691M. Krisztian only added a little to this ball 1 score to end ball 2 on 115M, while Laszlo made a partial recovery to boost his 5M from ball 1 up to 64M. The third ball saw solid progress by the top two, with Paul ending on 353M and Zach edging further ahead on 361M. Krisztian put another 31M onto his score to reach 146M while Laszlo was catching up with his 132M. Ball 4, and there were some very solid performances which would set the scene for the final ball showdown. Paul pumped his score up from 353M to 629M, taking the lead as Zach could only reach 439M on his ball 4. Krisztian brought himself into contention with a great performance which added 444M to his score which climbed to 590M, while Laszlo also jumped ahead by adding 270M to his total which rose to 402M. With the fifth and final ball still to play it was incredibly close and any one of the four had the title within their grasp. Just one good ball could decide the outcome. Zach almost managed to pull it off but it was not to be however. Paul had a quick drain to end on 641,333,960, giving Zach a target of an extra 202M to take the lead. He got close but could only manage to add 173M ending on 612,413,080. With Krisztian snapping at their heels with his 590M going into his last ball, only a quick drain could rob him of the lead. Unfortunately for him, that's exactly what he got, leaving him just ahead of Zach with 617,834,730. All eyes were now on Laszlo to see if he could add the 240M he needed to take the title. Again, a quick drain dashed his hopes and he ended his game and the final on 444,687,660. That meant the lead Paul had built up in the fourth ball remained intact and he won the game and the title. 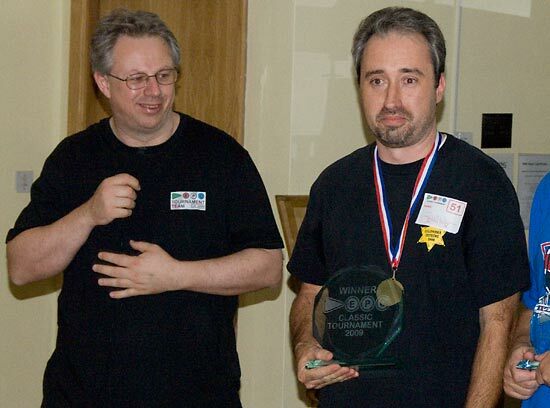 So Paul Jongma is the European Pinball Champion for 2009. 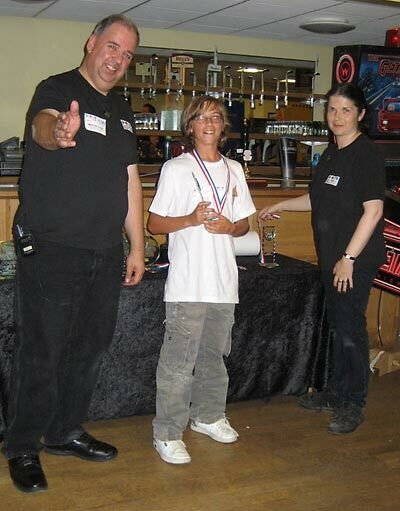 He collected the EPC trophy, his gold EPC medal and £400 (approximately $668 or €467) cash from EPC Tournament Director and Pinball News Editor, Martin Ayub. In second place was Krisztian Szalai on 616 million. Close behind in third was Zach Sharpe on 612 million and fourth was Laszlo Horn on 444 million. 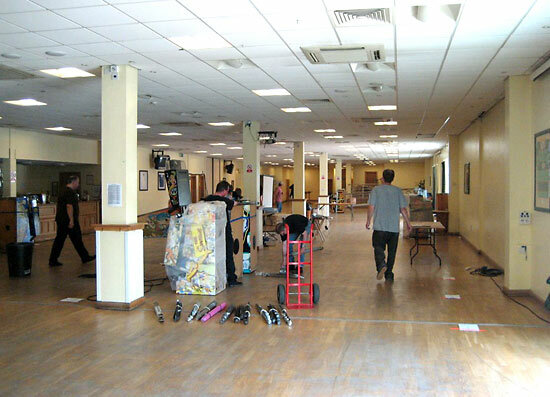 With the awards presented, the UK Pinball Show 2009 ended and it was time to start tearing down the games, dismantling the computer systems and packing away the stalls. Within a couple of hours, the show - which had taken 8 hours to set up - had vanished, leaving only a few signs, posters and pieces of bubble wrap behind. This year saw a larger number of helpers at the end of the show which everyone really appreciated and meant the journey home could start much earlier than usual. 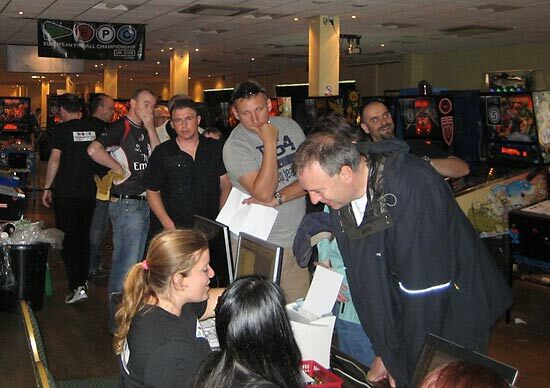 So with the 2009 UK Pinball Show and European Pinball Championship behind us, let's look back to Saturday 25th July 2009 and take our exclusive Three Minute Tour of the show. You'll be able to buy a DVD of this show and the following weekend's IFPA6 tournament when it is released later this year. A trailer is currently available on YouTube. Finally, a big thank you to everyone involved in organising, setting up, running and tearing down the show and the tournaments. Thanks must also go to everyone who hired vans and brought machines without which there would be no show. To the visitors and competitors, thank you for coming and really we hope you enjoyed your time. And to the victors, congratulations on your wins and we look forward to seeing you all at another pinball show in the not-too-distant future.